We offer this mini version of Hobbs Tuscany Wool batting for you to experience the pleasure of quilting with wool. Better yet, this piece is cut to fit any mini wholecloth quilt we sell. Hobbs Bonded Fibers and Harrriet Hargrave have developed this wool batting as a natural fiber alternative to polyester for the discriminating quilter. With proper care, wool is long and hard wearing. Tuscany Wool is made with chlorinated treated wool which is intended to prevent shrinkage. 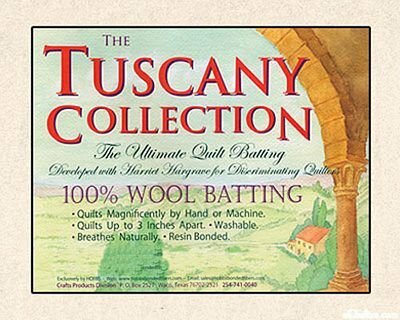 Items made using Tuscany Wool can be washed by hand or using the gentle cycle of the washer. Approximate loft is 1/4". Tuscany Wool needles wonderfully for both hand and machine quilters. Try it! You will love how easy it is to needle. Queen & King wool batting is only available at our location.